Interactive Whiteboards: Do I really need one in my classroom? Teacher’s not only have lessons to prepare, there is attendance to take, lunch counts, money collection for various activities, record keeping of all sorts and the list goes on. These things can take up a great deal of time and can interfere with the day’s instructional agenda. I noted one teacher who used her IWB to great advantage in her homeroom class. She had used Elmo to project menu choices on one half of the IWB and on the other half were student names. The students were able to drag their name with their finger under their menu option. A student was assigned to tally the totals and take them to the office. This was much more time effective than calling out names and recording each selection. The teacher was able to attend to other duties while the students took responsibility for lunch count. ELL students often lack the experiential background information that native speakers bring with them into the learning environment. Therefore, an effort must be made to give them a framework upon which to build schemata and increase vocabulary so they can actively engage in understanding and conversing about the world around them. An IWB could be used to do this effectively by projecting Channel 1 news on the IWB. (Channel One, LLC, 1989) After viewing a segment, the ESL instructor could guide the students in creating a vocabulary list of words that were new to them and words that are in their vocabulary but were significant in telling the news story. This list could then be used as the catalyst for group discussion or a writing assignment. 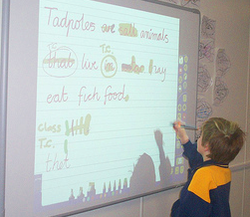 The ability to display computer images onto an IWB changes a useful visual aid like PPt into an interactive teaching tool. Both teacher and students and electronically “write” on the PPt. In this way, an IWB can be used for ELL students to edit grammar errors in sentences, quickly and visibility on the IWB means everyone is learning together. The move towards technology in the classroom will continue because of research that indicates beneficial results. One step in that direction is the SmartTable, (Smart Technologies, 1991) an interactive tool that is touch sensitive. I’ve never thought I would want to teach kindergarten, but give me this kind of technology and I’d be tempted to change my mind. ☺ Although the SmartTable was introduced a number of years ago for the preschool, kindergarten and primary grades, it has been too expensive for most schools to purchase. As the price of technology decreases, that should change. Recently, a SmartTable aimed at older students has been released. It is also wheel-chair accessible. It comes equipped with USB ports so that it can be used with other technology in the classroom. According to the manufacturer, “SMART Sync™ classroom management software enables educators to easily transition from small-group to whole-class learning by sharing SMART Table content on a SMART Board® interactive display.” They also have built in WIFI capabilities. Impressive, but with a nearly $8,000 price tag, it may be awhile before these are standard classroom issue. I favor a multi-sensory approach to learning. IWBs are one way to facilitate this approach. If an IWB were available in my classroom, I would choose to use it in a way that actively engages students in the learning process. I hope IWBs and tables become more reasonably priced and better utilized by teachers.